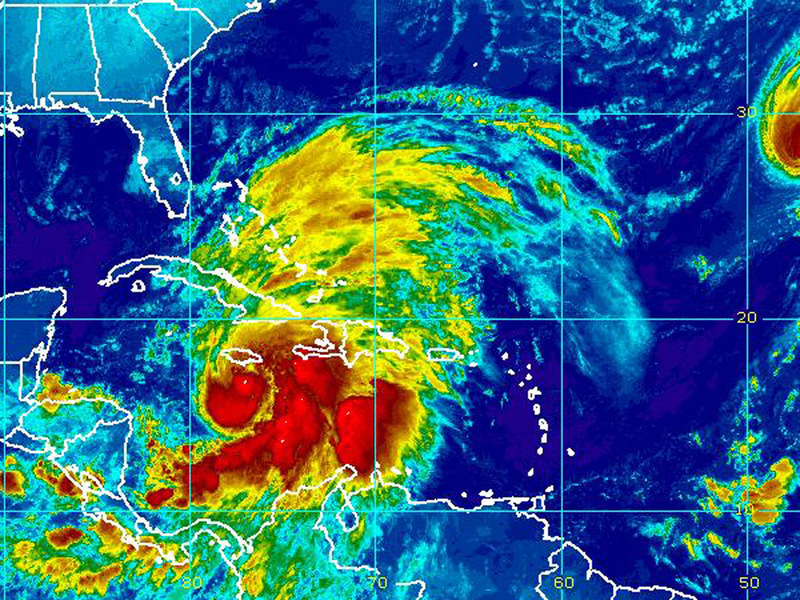 Jamaica braces for Sandy; U.S. on storm's horizon? KINGSTON, Jamaica Jamaicans hunkered down at home as the front edge of Tropical Storm Sandy buffeted the Caribbean island with pelting rain and howling winds early Wednesday before possibly crossing the country as a hurricane. The island's international airports prepared to close, cruise ships changed their itineraries and police ordered 48-hour curfews in major towns to keep people off the streets and deter looting as the late-season storm was expected to rake Jamaica from south to north at midday. The 18th named storm of the Atlantic hurricane season was forecast to pass over or near Jamaica and then spin on into eastern Cuba by Wednesday evening. It was expected to pass west of the U.S. naval base at Guantanamo Bay, where pretrial hearings are being held for a suspect in the deadly 2000 attack on the destroyer USS Cole off Yemen. David Bernard, chief meteorologist for CBS Miami station WFOR-TV, reports that by this weekend Sandy is predicted to be north of the Bahamas and continuing to move to the north toward the United States. Meanwhile, a large, wintertime jet stream dip with a lot of cold air is forecast for most of the Midwest, creating the possible scenarios that the dip could capture Sandy and pull it toward the East Coast or let Sandy just go out to sea, Bernard reports. However, a third possibility would let the storm go out the sea with all the warm air associated with the tropical system merging with the cold air and the jet stream dip to form a new low pressure system, Bernard reports. That scenario could produce a major nor'easter that could mean extremely heavy snows across the Appalachian Mountains and perhaps western Pennsylvania as well as very heavy rains along the coast and some very strong winds, Bernard reports. Across Jamaica, poor people in ramshackle shantytowns and moneyed residents in gated communities were jittery about Sandy's approach. Many sections of the debt-shackled country have crumbling infrastructure, and a lack of building codes has resulted in some middle-class homes and tin-roofed shacks being built close to steep embankments and gullies. Dangerous flash floods and mudslides set off by Sandy were a threat for the island of roughly 2.7 million inhabitants, Jamaica's meteorological service said. In the hilly community of Kintyre, near the capital of Kingston, Sharon Gayle and a few of her drenched neighbors expected to lose the town's bridge over the Hope River, which washed away a section of the span just three weeks ago during a heavy downpour. The storm was predicted to drop as much as 10 inches of rain, especially over central and eastern parts of Jamaica, the country's meteorological service said. Some isolated spots could see as much as 20 inches, according to U.S. forecasters. Battering waves and a strong storm surge were also forecast. Kingston's airport was set to close at 7 a.m. EDT Wednesday, and Montego Bay's airport planned to shutter at 9 a.m. EDT. Royal Caribbean Cruises Ltd. announced that its Allure of the Seas megaship would not stop at Jamaica's northern Falmouth terminal on Wednesday and instead remain at sea. In Cuba, authorities issued a hurricane watch for several provinces and there were intermittent rains over Haiti, where a tropical storm warning was in effect. A tropical storm watch was also posted for parts of the Bahamas, where the storm was predicted to pass Thursday. Although Florida was not expected to receive any direct impact from Sandy, Brian Koon, director of the U.S. state's emergency management division, said residents should remain aware of the storm and take precautions to keep themselves safe from indirect impacts including rip currents. Early Wednesday, Sandy had maximum sustained winds of 70 mph and was centered 120 miles south of Kingston. It was moving north at 14 mph. Meanwhile, U.S. forecasters said Tropical Storm Tony had formed over the open Atlantic, but posed no threat to land. The storm had maximum sustained winds of about 45 mph and it was moving east-northeast at 16 mph. Its center was 1,415 miles west-southwest of the Azores.